Sensex to make bottom in May end ? Possibility ? This is a nice little analysis done by one of our student which is on comparing the last few up and down moves on the index. 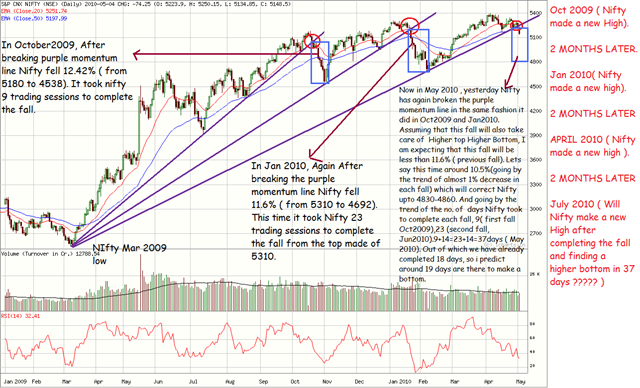 According to this index if it follows the pattern which it has been doing for last few months then it should bottom around May 3rd week to June 1st week and cross 18k in July 2010. Good Work – Ankit Chaudhary. Rest i will need to look into the same. 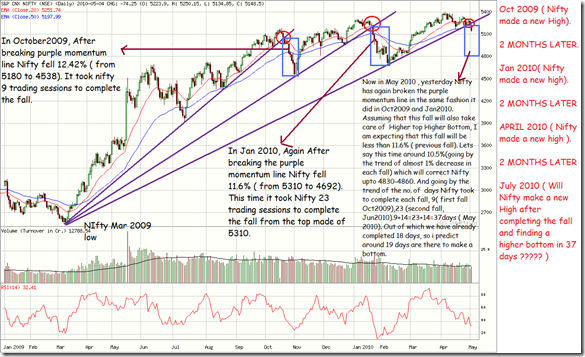 Although i am not so sure or keen on 4800-4850 coming. For the record i would say need more clarity 🙂 through market moves which are confusing as of now. Well i would be out with detailed analysis by next week on possibilities.For now i maintain my view of longs on Tata Steel and Hindalco and Index around 16900 with a target of 17400. Also have been busy with personal commitments so analysis has taken a backseat for a week or so. I must say your target prediction is 99% accurate. Your target of 17400 almost achieved today with 561.44 points @ 17,330.55. Now do you revise your next target to 18,900 or still you think it is wait & watch?? Thanks for your kind words. Well i dont predict 99 % right 🙂 i would be more then happy with 65-75% hit rate. The last few months have not been that great though. Sensex for now should pause around 17400. We will take it from there but as per the time analysis analogy we need to wait till end of this/next week to confirm that we have found a bottom. wat u think abt bharti airtel….? ?